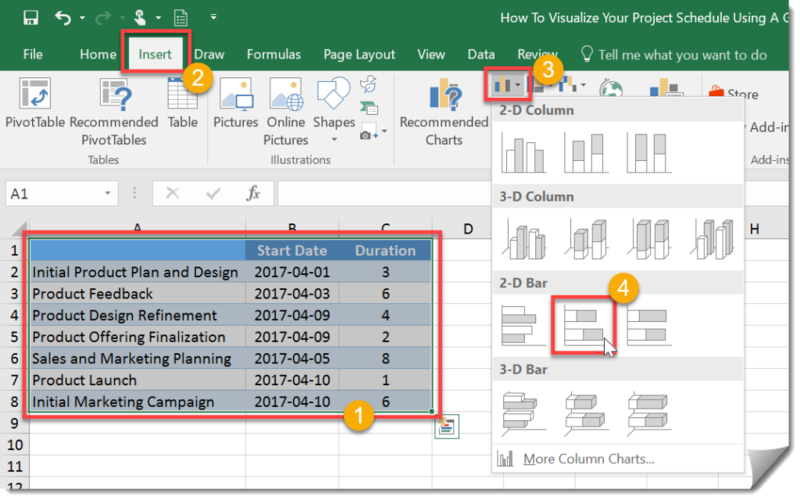 How To Make Gantt Chart in Excel - Something New Everyday! 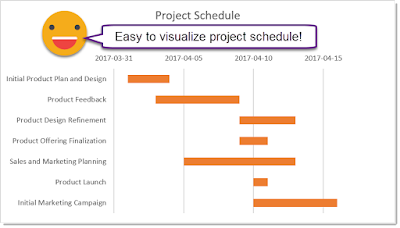 You can easily visualize your project schedule using a Gantt Style Chart which can be a great project management tool to help you keep your projects on track. Excel doesn’t come with an option for a Gantt style chart but you can construct one using a stacked bar chart. Add a stacked bar chart. Select your data. The data will need to be in a particular format. The list of your Project Tasks should be the left most column and not have a column heading. The Start Date of the task should be the next column to the right of its task. This need to be in an Excel date format. This field should have a column heading. The Duration in days should be the next column to the right of the start date. This need to be in an Excel date format. This field should have a column heading. Go to the Insert tab in the ribbon. Select the Bar Chart icon from the Charts section. Select the Stacked 2-D Bar Chart. This will insert a basic stacked bar chart into the sheet. We will need to format this chart to get it looking like a proper Gantt chart. 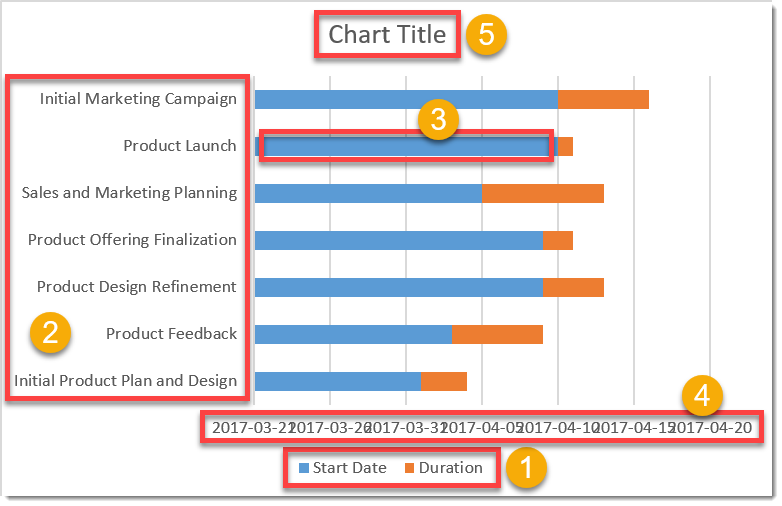 Format the default stacked bar chart to look like a Gantt chart. Delete the legend by right clicking it and selecting delete from the menu. Right click the axis showing the task list and select Format Axis from the menu then check Categories in reverse order. Right click the Start Date series bar and select Format Data Series from the menu then select No fill and No line. Right click the axis showing the dates and select Format Axis from the menu then adjust the minimum and maximum bounds as needed. Now you have an easy to see project schedule!